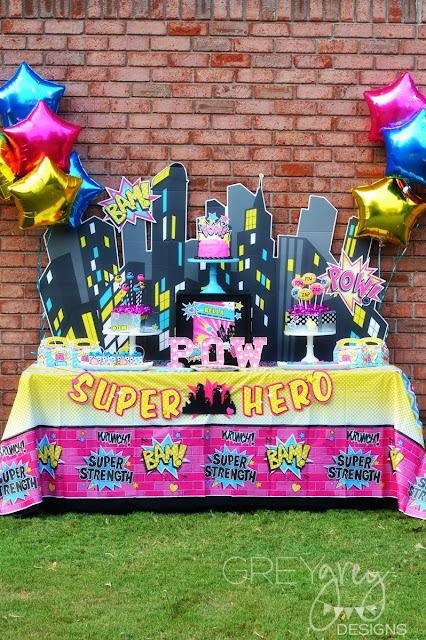 Do you have a superheroine in your family? 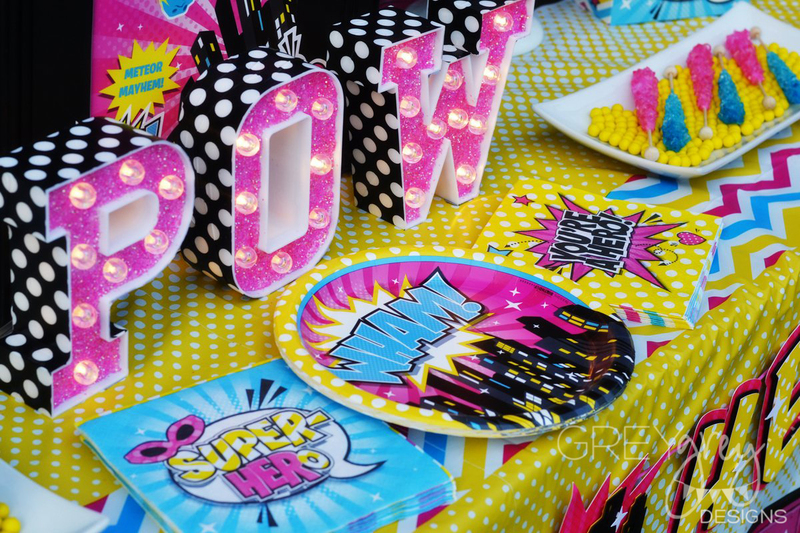 I love the idea of girls being superheros! 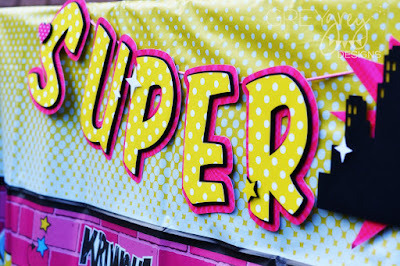 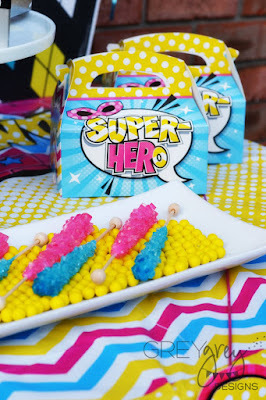 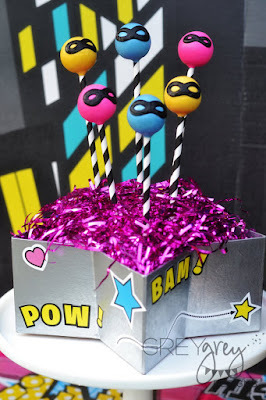 I loved styling this fun girly superhero party last year for Birthday Express. 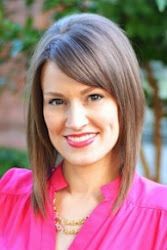 Come see all the fun details I added to make this really girly and fun! 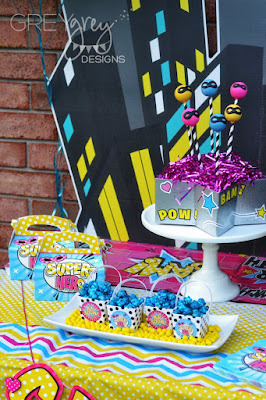 I started with this fun cityscape backdrop and added this themed tablecloth. 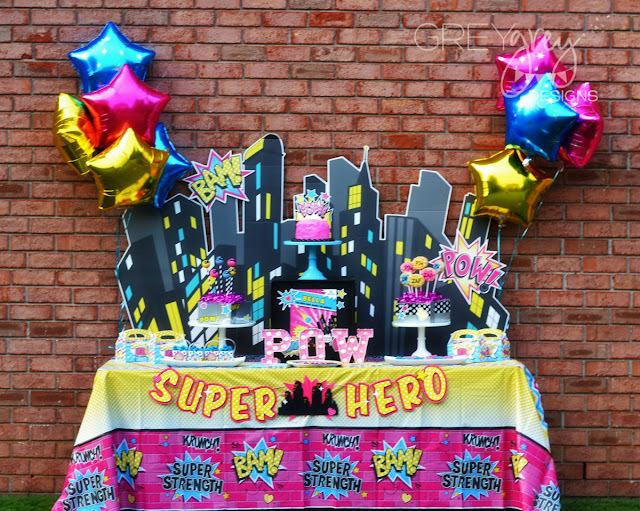 I love the idea of doing this party in front of a brick wall, since it bring to mind cities and buildings. For the cake, I had to do a pink cake. 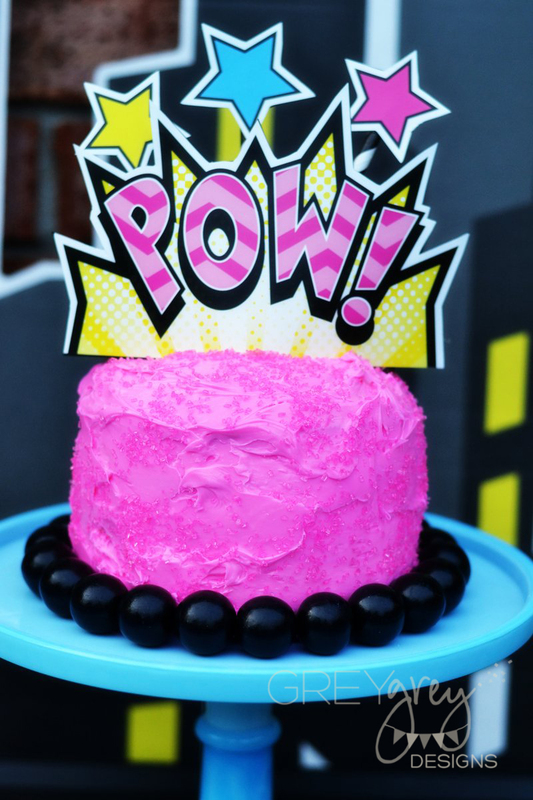 Pink and glittered, of course! 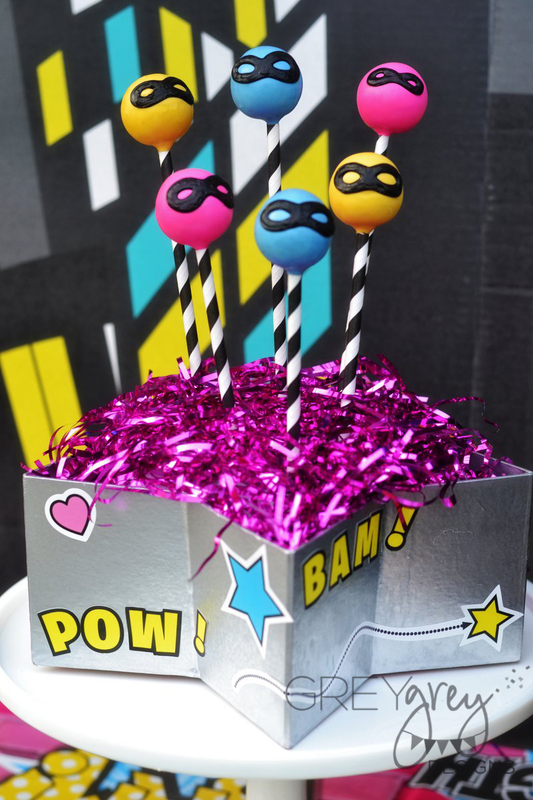 I added black gumballs around the base and added this fun cardboard topper for height. 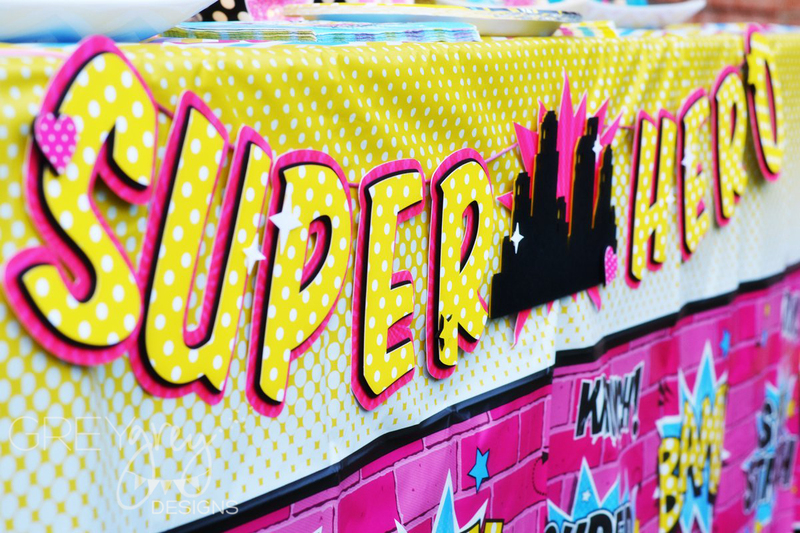 I displayed it on top of a simply black storage box and added this comic book sticker to the front. 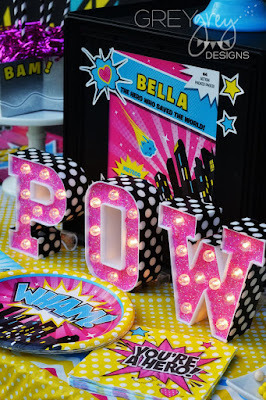 I picked up these marquee letters at Target on clearance and then customized them with pink glitter and black and white polka dot tape, to bring in the pop art element. 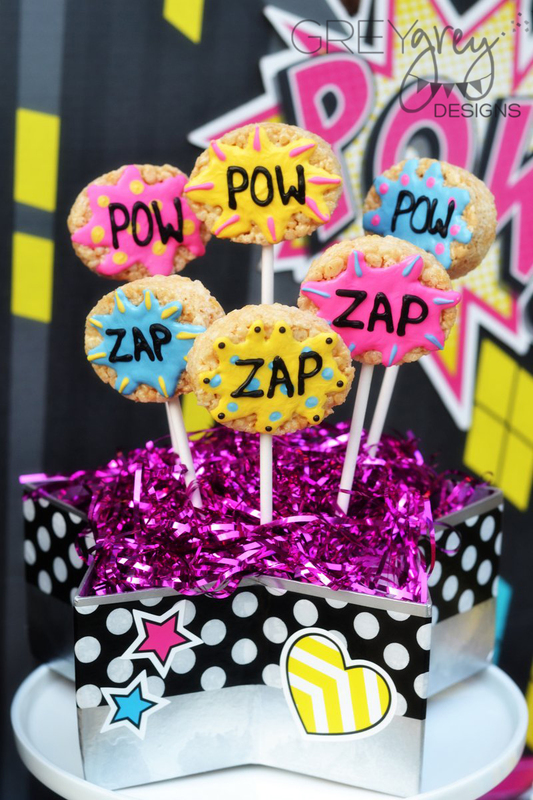 For my other treat options, the wonderful Nicole at Bella's Bakery and Boutique sent me these amazing rice krispie treats and cake pops! I displayed them in these simple chipboard star boxes that I painted silver and embellished with stickers and washi tape. 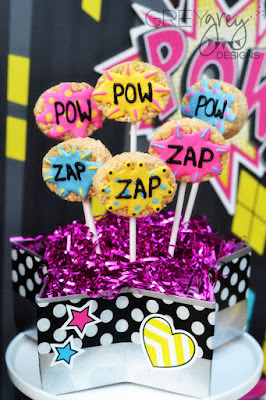 Isn't everything cuter on a stick? I think so. 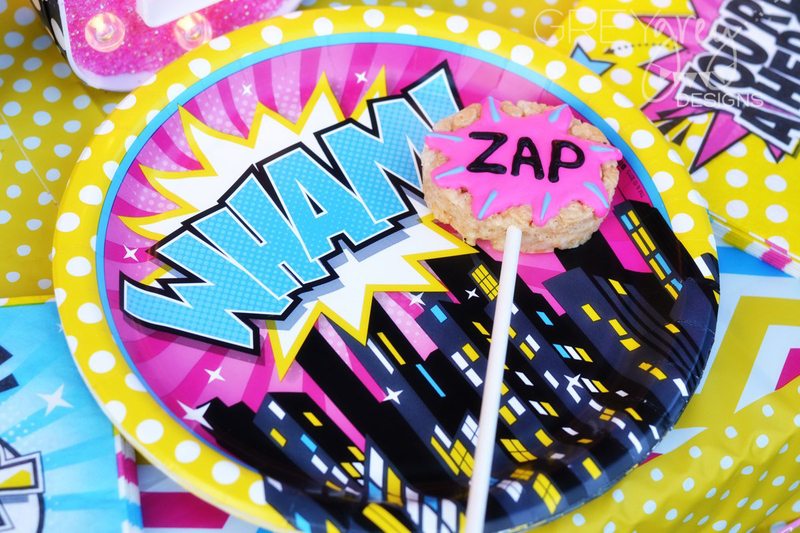 To balance the table, I added sticks to the rice krispie treats as well. 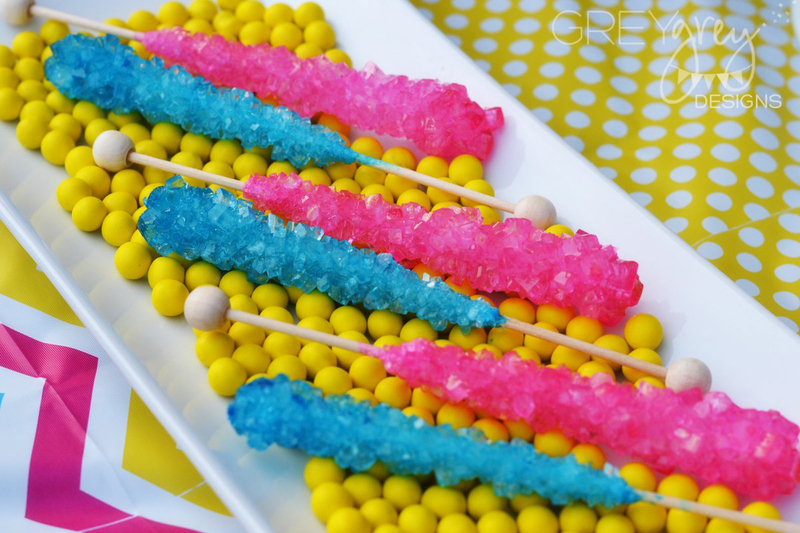 I added some rock candy in the colors of the party and displayed them on a simple bed of yellow sixlets. I love serving popcorn at superhero parties because I think it lends itself so well to the theme. I mean, "pow," "pop," "boom!" 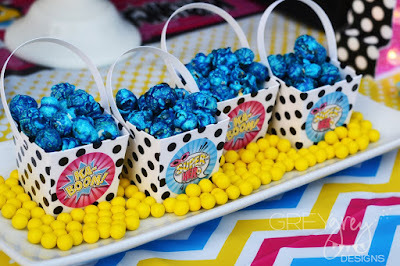 I found these cute little mini baskets at the craft store and added a sticker to the front and put them in a bed of sixlets too. 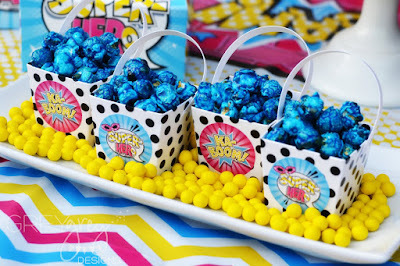 Then, I added fun blueberry popcorn from Oh Nuts. 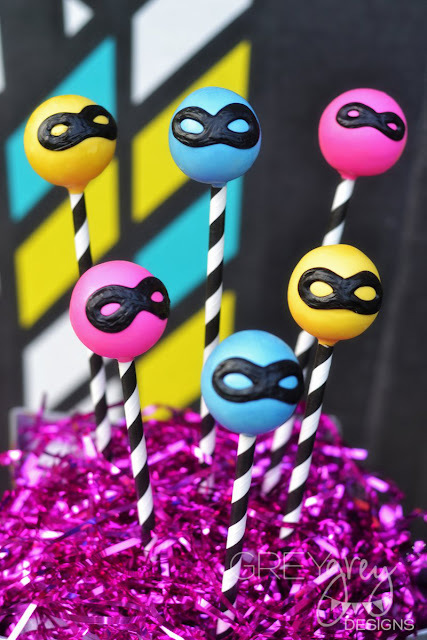 And just because I like this close-up of these amazing cake pops! 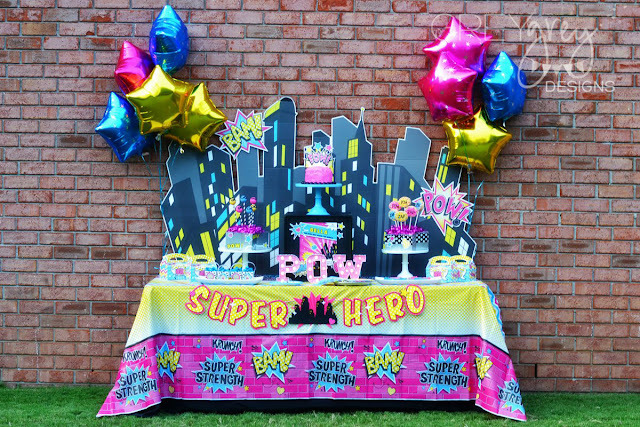 My dear friend Do at Piggy Bank Parties outdid herself on this banner for the front of the table! 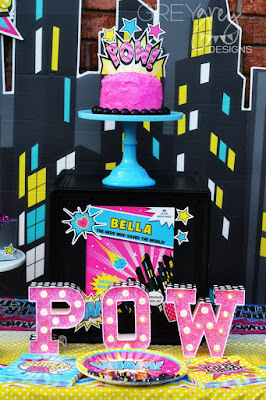 It is a work of art! 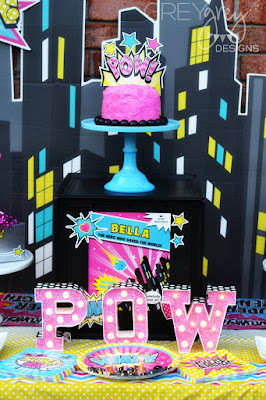 It's amazing to me that someone can make something this amazing out of paper!!! I love how well these cake pops and rice krispie treats coordinate with the party ware! 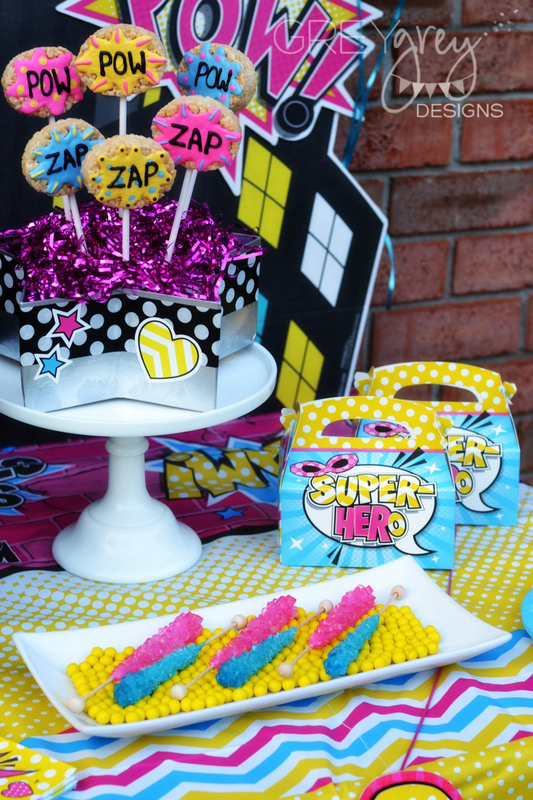 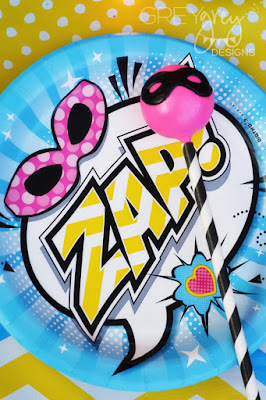 I hope this gives you some fun ideas to make your little superheroine's birthday really POP!